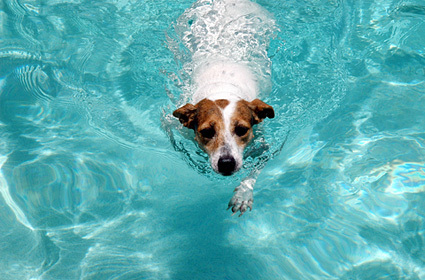 Check out these hot-weather tips to help prevent your pet from overheating. Feel free to trim longer hair on your dog, but never shave your dog: The layers of dogs’ coats protect them from overheating and sunburn. When the temperature is very high, don’t let your dog linger on hot asphalt. Being so close the ground, your pooch’s body can heat up quickly, and sensitive paw pads can burn. Heat rises from the ground, especially on surfaces like cement and asphalt, and dogs absorb and release heat through their feet, so slip on some dogie boots. Be sensitive to old and overweight animals in hot weather. Brachycephalic (snub-nosed) dogs those with heart or lung diseases should be kept indoors in air-conditioning as much as possible. Symptoms of overheating in pets include excessive panting or difficulty breathing, increased heart and respiratory rate, drooling, mild weakness, stupor or even collapse. They can also include seizures, bloody diarrhea and vomit along with an elevated body temperature. Move your pet immediately to a cool area – either into the shade or preferably into air conditioning. When your dog seems more comfortable, call your veterinarian for next steps. Provide cool water that’s not ice cold. Begin cooling procedures by soaking the body with cool water – cool, but not cold. Use a hose, wet towels or any other source of cool water that is handy. Provide cool air for your dog to inhale. You can have your pooch breathe the air from an open freezer or air conditioning.